In summer seasons we generally prefer a low-fat low-calorie diet even on the celebration days for that the Kabab is our one of the most favorite item on the leisure days. Most beautiful fact is one dashing dish of kabab not only attracts our eyes, but also gives a pleasure of our craving to it. I used to ready and stock them in the refrigerator for our guests, but my calculative kabab experiment was hit this time. I just converted a desi Bengali dish to kabab. I made the world famous "the gandharaj Betki" fish kabab with those very traditional recipe ingredients. My key ingredients of success is old techniques as kabab should never be over marinated, never overcooked, and I always followed the rule of Persian word "Kum" a little "aab" water, means marinated with very little moist or no water and most important thing is cooking temperature should be higher than the meat, fish or other main ingredients as well as evenly distributed for uniform cooking. Kebab always needs a constant watch of temperature and need to turn them time to time. In this kabab process, I did not need extra basting or brushing oil to keep them moist and succulent. I used my nonstick tawa, I was more comfortable with that than thick gauge iron tawa. Once I tried this recipe in my microoven, though the finished product had good crust, but was dry. Flour, rice flour, and toasted sattu: [equal portions mix well] 1 tablespoon. 1. Marinade boneless fish with lemon juice, ginger paste and salt, keep aside for 10 minutes then keep the fish on a strainer to discard the water well. 2. Take the butter and lemon zest. beat until fluffy. 3. Marinade the fish with the second marination except lemon leaves, keep aside for 30 minutes. 4. Steam the fish with marination in a steamer until the fish get properly cooked, do not cover with the lid, let it slightly dry, only cover the fish with those lemon leaves before steaming. You can microwave the fish for this step. 5. Discard the lemon leaves and star anise from the fish. 6. Let the fish cool. Now mix well with your hand, add shahjeera and white pepper powder, minced onion, green chili, and coriender leaves. Now add the bindings little by little to make the shapes of the kabab. 7. Keep the kababs in the refrigerator for at least 10 minutes uncovered or else it will loose water. 8. Actually I used my old nonstick tawa to make kabab, because kabab needs high flame and nonstick utensil gets less durable after doing so. You can take any heavy-bottomed iron cast pan, handi or earthen pot of your choice. Add oil to the pan, put the pan on high flame, shallow fry the kababs in a batch until slightly dark in color, need not cook much. 9. Rice flour will give a perfect crust to the kabab. Sprinkle chaat masala, salt and roasted red chili powder, serve immediately with dip, onion rings, and lemon edges. I char-grilled one whole green mango, after peeling it, I made a paste of the mango flesh, added 1 teaspoon mint and coriander leaves paste, 1 green chili paste, and added salt, lemon juice, and sugar to taste. Believe it or not, this is a desi drink. The recipe is, mix half cup sour tamarind pulp with 1 cup sugar and 1 cup water, boil for 10 minutes in low flame. Put off the heat. Add 1 teaspoon mint juice, half teaspoon white pepper powder and 1 to 2 teaspoon rock salt to it, mix well and chill. Make fruity ice cubes. I made from ripe mango pulp, watermelon pulp, and khus syrup. Take one tablespoon of tamarind juice, half cup soda water and half cup chilled water. Shake well. 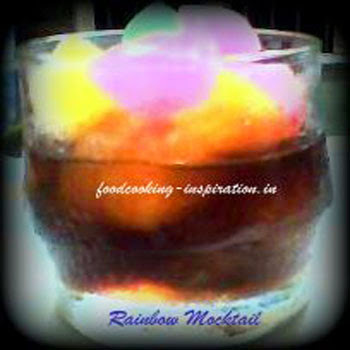 Serve in a glass with fruity ice cubes and enjoyyy.